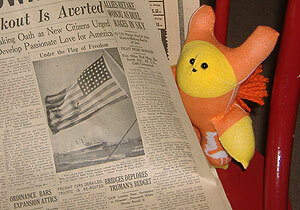 Sock dolly reads vintage newspapers. 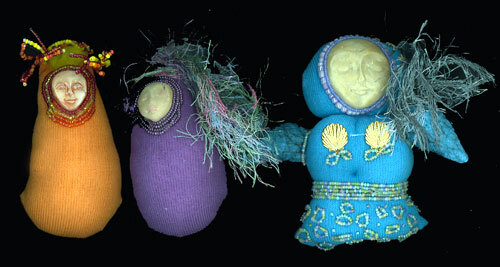 Last year, I began making sock dolls. I was inspired by the book Stray Sock Sewing. 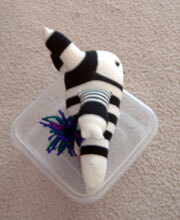 Here’s how I made my sock dolls for the Wild Art Dolls swap in July 2010. You will need one sock, some batting or stuffing, Fray-Check, and your basic sewing supplies. (Needle, thread, scissors, and a thimble if you use one.) You’ll also want something for eyes, nose, and other embellishments. At the very least, that will be embroidery thread, yarn, or a contrasting color of regular thread. This is the sock I started with. Then, stretch it out so the heel is exactly centered, horizontally. Then, the finished doll won’t look too off-center. Arrange the sock so the heel is centered. Next, you’ll cut off the toe part of the sock. You’ll be removing somewhere between 1/2 and 1/3 of the sock above the heel. That will vary with the size of the sock and your plans for the doll. Remove the toe part of the sock, and a little extra. If you remove a smaller amount, the doll will have longer ears and shorter arms. If you remove more, there will be shorter ears and longer arms. Remember: If something goes terribly wrong, you still have another sock. You can use that to supplement the pieces you cut from this sock, or you can start all over again. The next step is to cut the cuff of the sock, perpendicular to the cuff. What you’re doing is cutting the seam area for the legs. For shorter legs, leave more uncut. For long legs, cut closer to the heel. Above all — unless you have an octopus kind of doll in mind — don’t cut all the way up to the heel. Starting at the cuff of the sock, cut both layers up the middle. The next step is to cut a notch where the ears will extend. Once again, the deeper the cut, the longer the ears. Avoid cutting all the way down to the heel, unless you want a really deranged-looking doll with a strange, short face. Cut a rectangle or square out of the remaining area where the toe was. Finally, you’re going to use the toe part that you cut off at the beginning. Lay it flat and snip in into two equal parts. These will be the arms. Cut the toe part in half – just one snip – to make the arms. You’ll need Fray-Check, a product by Dritz. Apply a moderate amount of Fray Check to every raw edge on the doll. 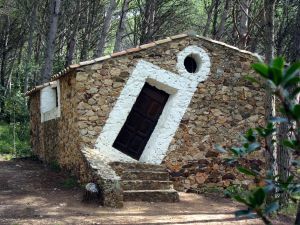 Be especially generous where there are angles, indicated by the blue arrows. Those points will get the most stress as the doll is being finished. Let the Fray-Check dry completely. This can take an hour or two. Don’t sew while the fabric is damp, or it can stretch and bubble. Next, sew the top of the head. 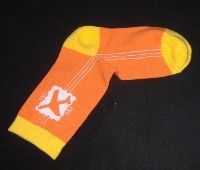 That’s where you cut the rectangle out, and it’s on the right side of the sock in the photo above. Sew the ears and the top of the head. Sometimes I sew along the wrong side of the fabric, and then turn the doll right-side out. At other times, I sew the whole thing from the outside, using an overcast-type stitch. Then, turn the doll right-side out, so you can start stuffing it. Stuff the doll from the bottom. When you’re stuffing the ears, it’s a good idea to make them fairly solid. I use a chopstick or a stuffing tool for this purpose. 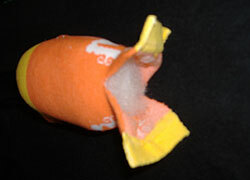 If the ears are really long, you may want to insert a wire after the ears are stuffed. You can use a pipe cleaner or any firm but flexible wire for this. Then, you can bend the ears in zany angles. Now, you’re ready to sew the legs, stuff them, and then sew the edges of the feet. When your doll looks like this, you’re ready to work on the legs. 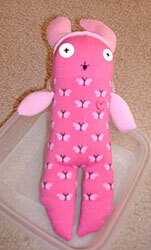 Finally, when the doll is how you want it to look, stitch along the bottom edges of the feet. At this point, I like to add the beads or buttons for eyes, and a nose. I usually use embroidery floss for the nose. The doll is beginning to have character. I think that’s important, before attaching the arms. Arms can make a remarkable difference in the attitude of the doll. For the arms, you’ll sew the seams on the toe pieces you cut at the beginning. Sew just the longest side of each one and stuff it. Depending on how hard it is to hold the shoulder part together, you may want to baste it closed after the arms are fully stuffed. 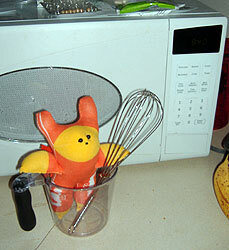 If they’re only loosely stuffed, you can skip the basting step and attach the arms directly to the doll. After that, you can add wings, hair, a pom-pom tail, or any other embellishments you like. 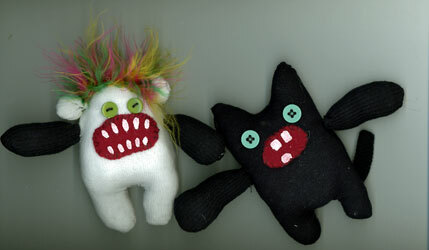 Here are a couple of other sock dolls I’ve made. They were propped up in Rubbermaid sandwich containers, so you can see them better. That also gives you an idea of the scale of them. 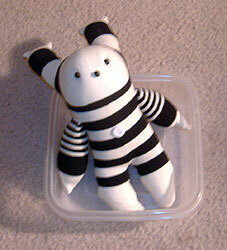 Black-and-white sock doll. Bead & button embellishments. Here’s the same doll in profile. He has a yarn pom-pom tail. 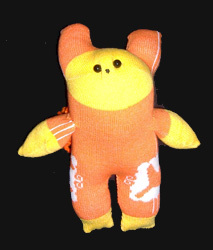 Another doll, shown below, is made from an adult’s pink sock. The top of the head looks like the doll is wearing a cap. I made the cap from a second, different pink sock. I let the lower edges roll up, like the brim of a knit cap. I also embroidered a heart on her, and gave her faerie wings. Once you get used to making these dolls, you’ll find ways to mix n’ match pieces from different socks for different effects. I can usually make one doll in an evening (about three or four hours), while I’m watching TV or talking with my family. Sock dolly helps in the kitchen! Use children’s socks for the best colors and patterns. For larger, colorful socks, I find good patterns & prices at places like TJ Maxx, especially in their sale sections. If you’re interested in tiny socks for the dolls or to add as ears, arms, or a tail, check the $1 section of Michael’s Arts & Crafts. Some of their Mary Engelbreit-type socks can be wonderful for sock dolls! If your doll might get soiled easily, use any waterproofing spray on stain-resisting spray, after you complete the sewing but before you add any beads or buttons. If you’re making a doll that you’ll turn inside-out, after sewing, always try to make the final seam (the one you’ll sew on the outside) where the doll sits down. That way, the seam isn’t so noticeable. If your dolls are small enough, check the dollhouse furnishings aisle (at Michael’s, etc.) for accessories you can use with (or glue to) your sock dolls. A sock doll swap is an exchange of dolls made from socks. 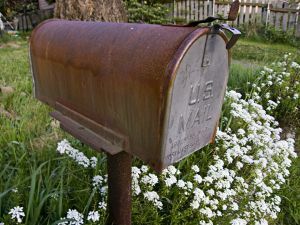 In this 2010 Wild Art Dolls exchange, the dolls had to be made from socks and three of them had to fit inside a flat-rate Priority Mail envelope. I love making dolls from socks! 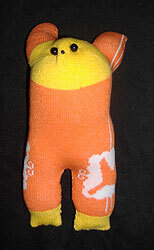 Of course, the classic sock doll is probably a sock monkey, invented around 1932. I think many people have happy memories of sock monkeys from childhood. 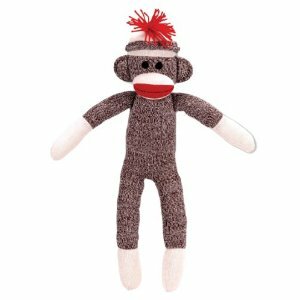 A quick survey of Amazon will show lots of different kinds of sock monkeys, including a Beanie Baby sock monkey, and books about making dolls (including sock monkeys) from socks. The first rule of cloth doll making is: BREAK THE RULES! Nobody said the skin fabric has to be pink. Or muslin. Or brown. Or whatever. Your doll’s skin can be purple. Or green. Or paisley. Or white lace over silver lame that you’ve fused to muslin. Nobody said that your dolls’ legs and arms and faces all have to be made with the same fabric. Nobody said her (or his) clothing has to be tasteful, or stereotypically shocking with black lace and a boa, either. Nobody said that your doll has to wear clothing made of fabric, either. Feathers might work. Or foil. Or maybe you’ll melt some 3.5″ computer disks (ventilate very well if you heat them) and give her a high-tech breastplate. When you’re making a cloth or mixed media doll, you have many, many options. Don’t be limited by rules in your head. And don’t be limited by rules from famous dollmakers or even your teacher. Cloth doll goddess Elinor Peace Bailey once made an amazingly insipid doll, just to break her own anti-rules. The point is, when you plan your doll, think big. Think original. Break the rules. Be outrageous. But mostly, be your most creative self. Not sure how to choose the right cloth doll stuffing? Here’s the punch line: Buy the best doll stuffing (ex: fiberfill, polyfill, batting, cotton wool) that you can afford. The cheap stuff may look the same in the bag. It may even feel the same if you squeeze it. In terms of lumps in your doll (or your teddy bear), and how the batting holds up over time, there is only one way to go: Buy the best doll stuffing you can afford. You won’t regret it. I like Fairfield and Mountain Mist stuffing and batting for my own dolls. I buy their top-of-the-line products, and I’m always pleased with the results. Right now, I lean towards Fairfield for doll stuffing, but that’s a matter of personal taste. See what’s available in your local shops. As long as you’re buying a very good brand, and avoid their “bargain stuffing” (if they have one), try different kinds and see which suits your dollmaking style. While we’re talking about cloth doll stuffing, remember to stuff your art dolls so the filling is tightly wedged into the doll. If it’s too loose, the doll will look lumpy after she’s been picked up, hugged, and otherwise played with for a few months. For the best results, collect a variety of doll stuffing tools. One great tool is called a Stuff-It. It used to be sold by Dritz, but it’s hard to find now. It can be used to stuff teensy fingers, as well as turn nice corners. If you can’t find that — and if you’re stuffing lots of tiny corners, fingers, etc. — you’ll fall in love with the Clover Stuffing Tool. It’s not as generally practical as the Dritz Stuff-It tool, but for detailed stuffing, you’ll want to own the Clover tool. It’s also ideal for turning itsy-bitsy cloth fingers. Your dollmaking kit will also include a chopstick or two. The lacquered kind with the fine point on one end and a round or square end on the other, is amazingly handy. You may want to sand the lacquer with very fine sandpaper, so the lacquer doesn’t slip through the stuffing too easily. If you do a lot of dollmaking, go to any arts & crafts store and select a few plastic tools intended for shaping clay. You’ll be amazed at how handy they are, for turning and stuffing dolls. I bought this set and I’ve used them for all kinds of arts & crafts projects… none of which involved clay. The idea is to have tools that are pointy, but not too pointy for the job. If you try to use a pencil point, it invariably slips through the stuffing, leaving a lead-black mark that shows through the fabric. Ick. Getting pencil marks off fabric… well, it’s not easy. Buy great doll stuffing. You’ll need at least two or three times as much as you think, looking at the bag. It will compress to about one-quarter its original size. Or more. I usually buy a one-pound bag for a normal, happy teddy bear. That same bag will fill at least half a dozen sock dolls, and several medium-sized dolls. Never, never, NEVER buy cheap doll stuffing. It’s not worth it. Even from the start, the doll just won’t look quite “right.” I don’t know why, as the stuffing’s weaknesses usually doesn’t show up right away. But I learned quickly; cloth dolls (and teddy bears, and other stuffed figures) don’t look as good if the doll stuffing isn’t top quality. Buy the best cloth doll stuffing, and your dolls will thank you for it. I’m using this in my current cloth dolls and figures. It’s easy to handle, holds its loft well, and — with a Stuff-It tool — it wedges nicely into tiny corners. It seems to wash well, so I also use this for a trapunto effect (stuffing details separately, through concealed openings in the fabric) in my other fabric art. 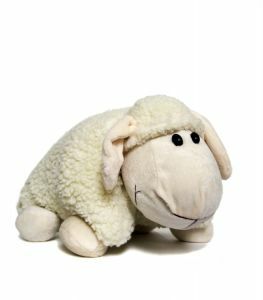 Because this stuffing holds up well and remains fluffy, it’s a good choice for large dolls and stuffed animals that a child will use as a pillow. 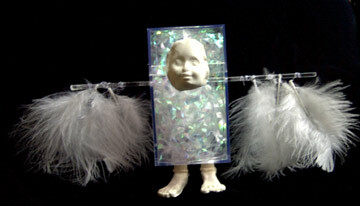 Tips and Tools for Creating Soft-Sculptured Dolls by Miriam Gourley. Have a question or a helpful tip? Leave your thoughts about cloth doll stuffing in a comment, below. Should you preshrink fabrics (or prewash them) before making a cloth doll? If you’re preshrinking fabric, use a dryer, not a clothesline. Yes… and no. It depends upon what’s important to you. Fabrics, especially cottons, never look quite so “fresh” after prewashing. The sizing* and surface finish wash off, so the fabric doesn’t look as smooth. In most cases, you’ll never wash the doll in a machine anyway. Why worry about shrinkage? Also, not preshrinking fabric saves you considerable time since you won’t be ironing it. You can rush home with your new fabrics, and head straight to the cutting table. That’s ideal if you have amazingly creative visions in your head, and you can’t wait to turn them into a doll or two or three! Dolls seem to turn out best when the full energy of your brilliant concept is right there, fresh in your mind. 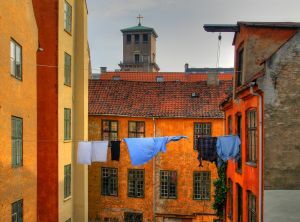 Pausing to do anything mundane, such as washing & drying, can be lethal to that fresh & vital energy. In other words: You don’t have time to preshrink fabrics. Just get to work and create that doll! Yes, the fresh-from-the-store surface treatment may repel inks and paints when you’re adding details (such as the face). That’s easy to fix. Add a couple of drops of a surfactant** to your painting water, to break down the resistance. Prewashing is not necessary. When fabrics have been treated with sizing and a surface finish, they often won’t accept paint, pen, and/or felt marker designs as well. If you’re adding a lot of artwork to the surface of your doll, that’s a problem solved by prewashing. If the doll has an accident — like when something spills on her — you can wash her (carefully, of course) without worrying about the results. Prewashed fabrics have already shrunk, bled, puckered, and softened as much as they’re likely to. If you always preshrink fabrics as soon as you bring them home, you can confidently use the same fabric in your wearable art and know that the finished garment can be tossed into the washing machine. First, I trim any loose threads off the fabric. They’re going to fray in the laundry. Sometimes, those loose thread can wrap the fabric into a tight, wrinkled ball by the time the drying is completed. If it’s a small and expensive piece of fabric, I may fray-check the cut edges to prevent further unravelling and fraying. Dritz makes a product, “Fray Check,” for this, and other manufacturers have similar products. It’s a lifesaver, in my opinion. Before prewashing, I refold the fabric so it is not folded along the same line as it was on the bolt. If you don’t do that, the original fold line will promptly wear and fade, even in the first washing. You’ll have to cut around that part of the fabric. I always wash the fabric by itself, or in the laundry with dark items that will not bleed. For example, my kitchen dishtowels don’t show stains, so they can be washed when I preshrink fabrics. If I’m not concerned about mixing fabric weights in the laundry, I often wash older blue jeans with my new fabrics, too. First, there’s the effect of water on the fabric. Some fabrics pucker, wrinkle, and go limp in water. The puckering and wrinkling can be steamed out when you iron. The limpness is resolved with a spray sizing or starch, usually added when you iron. However, if you’re going to paint or draw on the fabric, it’s best to apply the sizing or starch after you paint or draw, so the pigment is well absorbed. Next, consider the effect of soap and water on the fabric. The colors may run as you preshrink fabrics. The texture of the fabric may change, too. Almost anything can happen, particularly if you’ve bought a cotton by an unknown manufacturer, or a mixed-fiber fabric from the markdown bin. I use cold water the first time I wash a fabric. Some people also add a small amount of vinegar or salt to the water, to set the colors. Or you can use one of those disposable towels that absorb excess (“bleeding”) colors in the washing machine. Sometimes, texture changes can be remedied with plenty of steam ironing and starch or sizing. However, some fabrics will never look the same as when they were new, which is why some dollmakers prefer not to prewash. Finally, there’s the effect of dryer heat. I use the hottest dryer setting and dry the fabric for over an hour, usually tossing in other loads of laundry rather than wasting dryer heat on just one piece of fabric. In my experience, shrinkage is not eliminated until the fabric has been through two to three hours of dryer heat. If you love the fabric just as you bought it, and you don’t plan to wash your cloth doll, ever, there’s no reason to preshrink fabrics. However, if your doll may be exposed to wear & tear, and stains or dirt are possible, preshrinking can reduce worries. 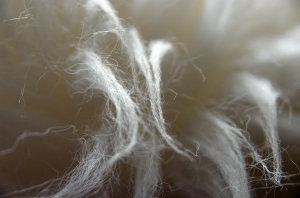 Fabrics can change color, size and texture in the laundry and dryer. In some cases, you can restore the texture. 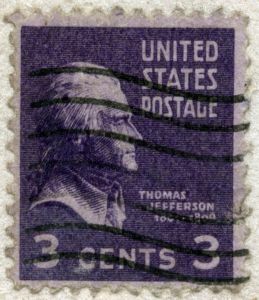 Faded colors and shrinkage usually cannot be reversed. I preshrink almost all of my fabrics before using them in dolls, but there are exceptions when the doll will be displayed, not worn (as a pin doll) or played with. * Sizing: Similar to starch, sizing is a fabric treatment that makes the fibers stiffer, crisper, and “fresher” looking. Sizing washes out in the laundry, but you can replace it in the rinse cycle, or with spray-on sizing when you iron. ** Surfactant: A product which breaks the surface tension of water, and helps “cut through” the protective layers sometimes applied to stain-resistant (and other) fabrics. Consider every reason to preshrink fabrics (or not to) before deciding. However, here’s another tip: If you’re in a swap that’s 5-for-5 or something like that, the list of participants is not a list of whose art should be in the envelope you receive. When you’re participating in a doll swap through an online group or community, the numbers may confuse you. Here are some tips to help you understand how doll swaps work. Aisling’s note: I posted this explanation at the WildArtDolls group at Yahoo Groups, where — in the past — people regularly swapped dolls. As of mid-2015, that group hasn’t been active for years, but we may re-energize it in the future. When a swap is 3-for-3 or 10-for-10 or anything like that, it means you’ll receive the same number of dolls that you sent. You’ll send four dolls and receive four in return, or whatever. It does not mean that you’ll receive one doll from each player. When hosts organize swaps, they have no idea how many people will play. So, a 5-for-5 swap means you’ll send five dolls and receive five in return, even if 150 people are in the doll swap. Many swap hosts figure that organizing the swap is enough work. They don’t necessarily want to make something for the swap, too. The swap will be announced as 5-for-4 or 10-for-9, or something like that. The first number is how many dolls you’re sending. The second number is how many dolls you’ll receive in return. You’ll send the requested number of dolls, and the swap host will keep one of them (as a thank-you gift) before sorting the dolls to send out. 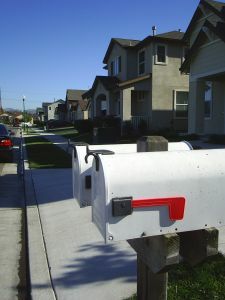 At the present time, most swaps seem to be organized that way. So, if you sent 10 dolls but received 9 in return… that’s exactly what you were supposed to receive. Some doll swaps are organized for fun, but also to benefit a specific group, usually a women’s shelter or a children’s hospital, or something like that. Those doll swaps may be something like 5-for-4 or 10-for-9, but they may be 7-for-5 or 10-for-8, or something different. So, you might send 6 dolls and receive 4 in return. One of your dolls might be kept by the swap host as the usual thank-you gift, and one of your dolls will be donated to the charity. Though I can post tips like this, every doll swap is different. Always read the rules carefully, and follow them to the letter. That will make the swap more fun for everyone, including the swap host and you. If you have a question, comment, or a suggestion about doll swaps, post it as a comment, below. 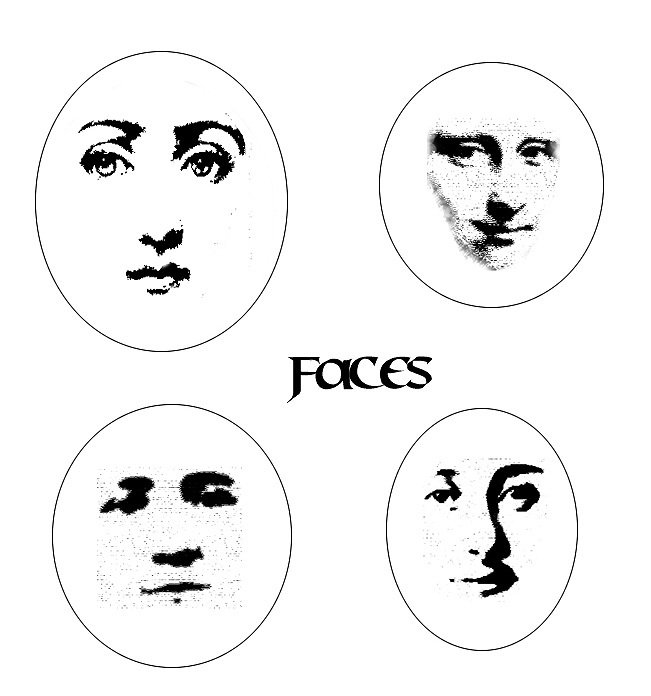 Homemade dolls’ faces are easy to make, even with little or no sculpting skills. Whether you want to make a doll’s face, a doll’s head, or a mask for a doll, you can make it yourself in under an hour. An existing doll that’s the right size, in any condition. Fimo, Sculpey, or a similar clay that you can dry or bake at home. In the photo above, you’ll see the molds I’ve made. They’re on the right. In the center column, you’ll see the results, after using those molds. You can make your own molds in any size. Here’s how I used one doll’s face from this experiment. Let’s talk about the two molds that I created, and how you can make them yourself. In the top row, the mold was made from a vintage international doll. That doll is made of cheap plastic and her face has a nice expression. First, I dusted the doll’s face with cornstarch. Then, I kneaded a lump of Fimo to soften it, and then flattened it slightly so it was bigger than the face of the doll. To create the mold, I gently (but firmly) pressed the Fimo onto the doll’s face. Starting at the top, I carefully peeled the Fimo off the face of the doll. I gently pressed the mold back into shape. Following the directions on the Fimo package, I baked the mold and then let it cool. Dust the mold very lightly with cornstarch or talcum powder. Press kneaded, prepared Fimo (or any clay that you can bake at home or air dry) into the mold. Carefully remove the Fimo from the mold. If the Fimo changed shape as you lifted it out of the mold, gently bend it back to the shape you want. Bake Fimo (or any clay) according to package directions. The result is a mask that you can paint, add ribbons to, and tie onto a cloth doll as a mask or an alternative face. By studying full-size masks — including Native American designs and Italian masks — you may think of more elaborate designs to modify your doll masks. In the lower row in the photo above, you’ll see a mold that creates a very simple face for a doll. This is a very stylized doll’s face, with a brow, a nose, optional area for eyes, and you can add a mouth if you want… or leave it blank. It’s a little like faces in artwork by Paul Klee, and inspired by the figures on Easter Island. I started with a small ball of kneaded Fimo. I smooshed it flat — about 1/4 inch thick — and smoothed the edges. Then I cut out a three-sided notch with a paring knife. That notch is the size and shape of the figure’s nose. After cutting the notch, I smoothed its edges. Next, I curved up the lower edge of the clay mold. That created a handle that makes it easier to use the mold. I baked the mold, following the directions on the Fimo package. Roll a ball of Fimo (or any clay you can bake at home, or air dry). Prepare to experiment with various sizes of lumps of clay, to get the proportions you want for your doll’s head. Place the ball of clay on a smooth surface. Carefully lift the mold from the clay. Add as many details as you want*, or leave the face that simple. Push something round-ish through the neck sideways, to create a hole big enough for a piece of wire. (I’ve used round toothpicks to make this opening, or a piece of spaghetti, or an orange stick, or a big yarn needle.) That hole will enable you to attach the head to a wire armature/body, or sew the doll’s head into a stuffed cloth body. Bake the head according to Fimo (or other clay) directions. *If you’re going to add beads or jewels or something else as eyes or other decoration, create a gentle indentation for each of them, but don’t add them until after you bake the head. Otherwise, the beads might melt, crack or even explode. With an existing doll** or a simple design concept, and some use-at-home clay such as Sculpey or Fimo, you can make molds for doll’s heads and faces. 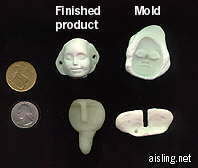 Then, you can use those molds to make doll heads or doll masks, also from home-baked (or air dried) clay. **Do not use a modern, copyrighted doll, particularly if you’re planning to sell or even give away the dolls you create. Though I can’t advise you about copying the doll’s face for your personal use, it absolutely cannot be copied to make dolls you’ll sell. If you’d like to reproduce these patterns for a class or workshop, that’s fine as long as the copyright remains on them, and you don’t charge anything extra for the patterns. These patterns moved here from my (former) Wild Art Dolls website. If any links don’t seem to work, let me know in a comment, below. Thanks! Belle de Lautrec and her zany sister, Tallulah Lautrec were created for a swap/round robin at the Yahoo group, Doll Journals. The patterns and instructions are in PDF format. You will need: Belle pattern pieces or the pattern for her sister, Tallulah. Instructions for creating Belle and her clothing (5 pages). Please read Belle de Lautrec and Tallulah – important reading, before you begin. Each of the next two patterns open in a new window. Neither of them have sewing instructions, yet. Right-click on the link to save the pattern to your hard drive, for use later, or click the link and print from the screen. Dangerous Women – a free, online doll pattern Print it from your screen, and/or enlarge the pattern so the “one inch” line really is one inch. The doll in this website header, above, is made from this pattern, and I added optional wings. Margaret Mary Fitzcalory-Smythe – a free, online doll pattern with no directions yet. She is a VERY skinny doll. That was intentional. I thought of her as a cautionary tale for those who willingly count calories to excess, and make themselves miserable in the process. It was a time in my life when I was very skinny (it’s a metabolism thing and it runs in my family), and people asked me how I did it. I wondered what planet they were on, because I was doing my best to gain weight. Some people have complained about how skinny the doll’s appendages are. Admittedly, they can be difficult to turn. So, you may want to enlarge her — or at least her arms & legs — by about 20% to make her more “average” sized. Paper doll faces, from my zany dolls in Art Doll Quarterly.